A lumbar sympathetic nerve block (LSNB) is an effective procedure for peripheral vascular disease and sympathetically maintained pain in the lower extremity. The lumbar sympathetic trunk is located in the retroperitoneal compartment surrounded by the anterior surface of the psoas muscle and anterolateral to lumbar vertebral bodies. The LSNB is commonly performed using the paravertebral or the transdiscal approach under fluoroscopy. After confirming the proper positioning of a needle tip, a local anesthetic is injected at the L2–L4 level. 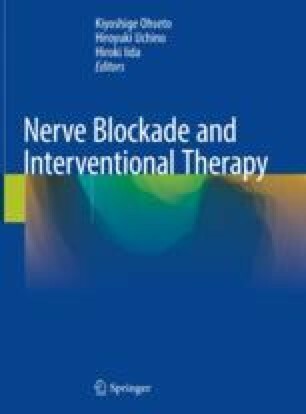 A neurolytic agent or radiofrequency thermocoagulation is used to provide long-term pain relief if local anesthetic block provides good but transient results. However, neurolytic genitofemoral neuritis may occur as a complication, although it is rare if the procedure is performed carefully by an experienced pain clinician.